ThoughtSpot is a new analytics search engine on your data. 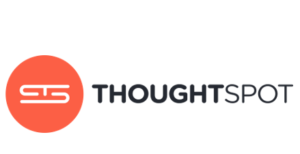 Cut down on months or weeks of wait time to seconds using the search and AI driven insights of ThoughtSpot. ThoughtSpot perfects the art of search engine capabilities to access billions of row of data and pull it back to dashboard in seconds delivering insight at the speed of light. ThoughtSpot removes the need to ask someone for help with your data by simply asking questions in the search bar of ThoughtSpot and you have your data in seconds either by region month or sales. That’s the power of thoughtSpot typing search into search bar having it interpreted rendering your enterprise results back in visual representation simply ask your questions and get answers. ThoughtSpot will also make suggestions for you that you may be interested in. ThoughtSpot knows what you have searched in the past and what groups you are in and will render any result you are looking for. You could also interact with the information that ThoughtSpot has displayed by simply clicking on any part of the data which will input the information in to the search bar for more charts and data views.